Bit of an upset here as Dominic Thiem defeated Roger Federer on his favourite surface in the semi-finals of the Mercedes Cup in Stuttgart. The Austrian saved 2 match points in a match blighted by rain delays to come through 3-6, 7-6(7), 6-4. Not Roger's best performance and he'll be a tad disappointed to lose it considering he won 1 more point in the match and was generally the better player for the most part but he at least has 3 matches under his belt ahead of Halle. Federer won the toss and elected to serve holding to 15 to kick things off. Thiem matched that to level but in game 4 the Austrian dropped serve after double faulting at 40-30. Roger consolidated to 30 for 4-1 but had to save a break back point at 4-2 before holding and serving out the set 6-3. Into set 2 and it looked as though Roger had the measure of Thiem but he stupidly took his foot off the gas, missing an overhead and dropping serve to fall 2-0 behind. Thiem was able to take full advantage going up a second break and moving into a 5-0 lead. Roger held to avoid the bagel and hit back to break for 5-2. That was quickly 5-3 and with the pressure back on Thiem to serve it out he again faltered as Roger broke then held for 5-5. The Swiss then had 15-30 on the Thiem serve but couldn't take advantage. A love hold from Federer sent the set into a tie break. The breaker was a bit of a weird one from Fed, after looking imperious in them so far this week, he relinquished an early mini break, missed 2 fairly easy match points, didn't land enough first serves then played a daft sliced drop shot which he thought about too much by watching Thiem and not the ball. Thiem took full advantage to take it 9-7. With rain already falling during the breaker play was delayed for around 30 minutes. Upon resumption Roger saved a break point in game and then had 2 of his own on the Thiem serve, hitting a wild forehand on the second which allowed the Austrian to make deuce. In game 4 Roger had another two break points but couldn't convert. At 3-3 Roger got himself into trouble by hitting over the backhand after a long rally dominated by slice, he came up with 2 great points for 30 all but slipped to 30-40 then missed a volley to get broken. Another rain delay followed and when the players came out on court Thiem held to 15 to consolidate the break, Roger held for 4-5 but the Austrian served it out in style to 15 to make yet another ATP final. Bit like Monte Carlo this one – good week, disappointing loss. Obviously it's good to see him back, 3 matches played so he will be happy as got lots of information blah blah more positive spin stuff. But I put this in the category of matches he should never lose. We got vintage Fed in the first set as Thiem never settled but Roger took his eye off the ball and it cost him. I'm not sure how Thiem managed to lose a 5-0 lead on grass with a serve like his but he did and then in the breaker Fed just didn't have that killer instinct to kill things off when he had the chance. Same story in the third set – lots of chances early doors but didn't take them and went onto lose. So yeah not great viewing but I don't want to sound too downbeat as you can't expect the world in the first tournament back. On a more positive note Fed looks pretty relaxed on the court and generally just happy to be playing. He definitely got annoyed when he was broken in the decider as he gave the net a swipe after he missed the volley so no doubt feels pretty similar to us watching. We still got flashes of brilliance but I don't think Fed's shot selection and match feel are quite there yet and why he lost today. A few points stick in my mind: the 2 botched overheads (very rare for Fed), the drop shot in the breaker where he wasn't committed and then the game where he got broken in the decider; on the first point it was a lengthy slice exchange where he decided to hit over it and lost the point. Always dangerous when you ‘change' what comes at you. Kills me every week as a club player and even get's the pro's too. That kinda sums it up the only other thing to add is credit to Thiem for staying with Fed all the way and taking his chances to make his first final on grass, for my money he's been the third best player so far this year behind Djoker and Murray. Anyway next stop Halle, the draw is out and I'll be doing a post on it pretty soon. Let me know what you thought of this in the comments. Missed a lot of chances, game not quite there for an entire match. Disappointed to say the least, but he needed to play competitive matches and i hope that helps for Halle and Wimby. Lots of points to defend from now on! BTW, i was on my way to the hospital when I posted this last Saturday, my second baby was born a few hours later hehe (please don’t tell my wife i was posting about Roger hahahahaha). A new Roger fan was born to the name of Javier González Castillo! Thanks for quickly, agreed that its one of those matches that he should have won in straight. Maybe match fitness it not there yet baring rust. Not taking anything away from Thiem, he continues to push forward not giving up. Kudos to him. Halle draw looks good but trickty Qtrs against Goffin. Happy to see that Thiem wont be meeting Roger in semis. Roger needs some match wins soon. Yeah Goffin on grass not great I don’t think but made 4th Round at Wimbledon last year so won’t be routine. Gotta think Fed has all the tools to defeat him though. I think all in all its a success that he had the final on his racquet in his first tourney back after a back injury. Sounds like even with the injury he well could have possibly won this tourney. And 8 sets over 4 consecutive days of play is good news for progress to match fit. Here’s hoping to more progress at Halle. Yeah weather not looking great, I just looked at a webcam of the airport and seems to be raining. Kohli and delayed finals, think he had same in Munich last year. Yeah, I see both den Bosch and Stuttgart rained off for the day, so assume they’ll have to finish tomorrow? Mahut has a match against Murray scheduled at Queen’s. Thanks for the post, Jonathan. I didn’t have a good feeling after the tie break so off to sleep I went. Perhaps as Roger ages, he needs to play matches on a consistent time frame. Too much time off might hurt him more now than when he was younger. Yes, I agree, should have won this one but then he is always the eternal optimist. On wards and upwards. Well, playing regularly was what Edberg suggested, wasn’t it? Yeah you deffo gotta play more the older you get. Same with all sports – bowlers in cricket – gotta bowl more overs. It is probably the first time that I didn’t feel much sadness about a lost match from the GOAT. It was a great performance from this young onehander. I have lost my hopes for Grigor. I know I failed on my predictions about an easy win for Roger but I still believe he is on the right track for Wimbledon. Well I think even playing Stuttgart puts him on the right track for at least being competitive at Wimbledon. With the way season has gone so far getting 3 matches isn’t too bad. Annoying loss but can’t be too downbeat. Slightly disappointed with the result but thought that Roger played reasonably well except for the big points in the TB. Opposite to the Mayer match, Roger should have closed it out in straight, especially on the first math point. Roger normally makes 19 out of 20 times that sort of drop volleys at the net; it proved costly. At the beginning of the 2nd set, Roger missed two straightforward shots (drop volley and overhead smash) in a row in his service game and got broken. He rallied very well to get back on level terms. 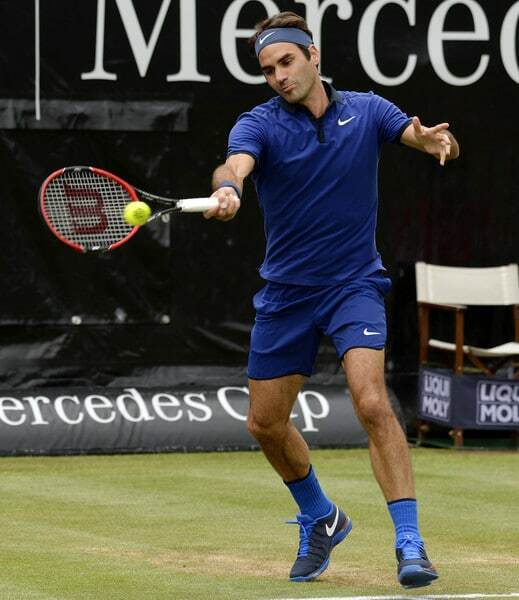 I feel that Roger will do well at Halle. Yeah pretty much every big point went to Thiem who served well on the break points. 2 overhead misses, unheard of from Fed. Bit disappointed really. Positives to take obviously especially with his movement but mentally I’m a bit concerned. Usually we see some lulls from him but two or three times today he completely zoned out of the match. 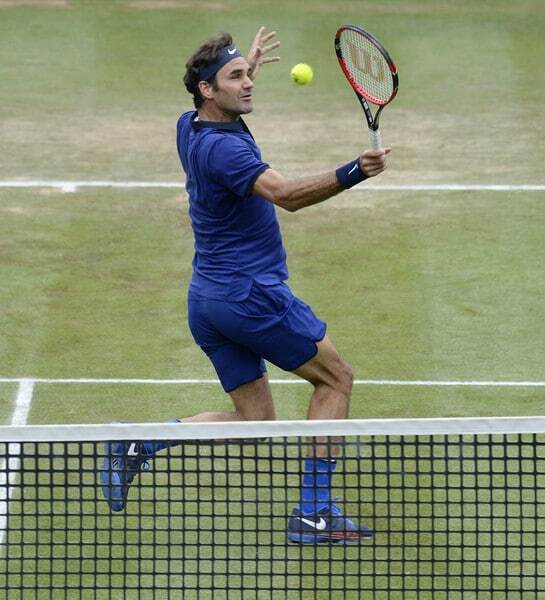 I’m hoping to see an improvement on this in Halle, I think we will but in my opinion it’s probably the main thing dragging his play down at the moment, more so than the slightly-off timing with his shots at times. “Fed just didn’t have that killer instinct to kill things off when he had the chance.” – whether the age or lack of match fitness or not, that peRFectly summed up what I thought it happened today. Never seen him missed so many overheads and dry volleys within a few games…but l’d like to see him lose rather than not seeing him at all. I wonder how come Nadal came back from injury so strong and won everything few years ago…2013? Well, Nadal *was* more used to it. Don’t forget this is pretty much new territory for Roger, so he hasn’t got the “I’ve done it before and I can do it again” mentality. Nadal plays so different too, every point is like match point for him so he’s very difficult to beat. And like Alison said – he’s done it plenty times. From comments it seems folks had fairly high expectations for this tournament. Fed was hoping to make the semis apparently. I knew I wasn’t good enough for any result here, so that’s why I hope you don’t read into it so much and I don’t… I was far off. I think to go from that match to almost match point for the final here is really good progress. But Fed needs matches. I don’t think there is anything other to be concerned about than that yet. I honestly don’t think Thiem is winning against an inform Fed – even at the late age of 34 years old. I think he just needs more time healthy and playing competitively. The GOAT will be back. You know, you may be right Alysha. But it’s funny – I actually remember this kind of match really being on the docket in dreaded 2013 when he was struggling all year with the back injuries at various levels of intensity – all because he didn’t pull out to heal as needed. Remember Berdych at Dubai, Bennateau at Rotterdam, Tsonga at RG, Sergy at SW19, and the horrible “extended clay season”. Halle was his only crown that year. It was one long slog of lacking that edge. It was an awful year. I think that’s why he’s tried so hard to stay away and rest up. I think he’s trying to make today brief blip on the way up. I don’t think it was a loss that will knock his confidence. Disappointing yes and should have won but not going to have much bearing. After Wanda’s comment about Nadal above in 2013 I remembered he lost to Zeballos in Vina Del Mar. Then looked up his year and in Sao Paulo he nearly lost to Martin Alund.Yeah who? lol and Berlocq nearly took him out. So it’s not too dissimilar. Well. Pretty much what Jonathan said. First set looks like a continuation of yesterday; then in the second set he just lost it for a while; then to fight back to 5-5 — it actually put me in mind of the 2014 Wimbledon final, though clearly not at the same level. And then after all that to fluff two match points! Exasperating. On the other hand his opposition was a lot tougher, as we knew it would be. Thiem can clearly play. Kid was moving front and back and side to side, and actually constructing points. Never gave up, even after that 2nd set seemed to be getting away from him. Seemed gracious and mature in the few press comments I saw. I’m impressed. Or the WTF against Delpo in 2013, was it? Came back from about 1-5 down? Wimbledon 2014 final comeback was just pure fight comeback though, clearly wanted that title. This one was just Thiem faltering and Fed taking advantage. I think 2013 WTF Fed was 3-0 down in final set vs. Del Po then won it. Yeah don’t know the stats but 1st serve went AWOL in breaker. Then opted for serve and volley behind that middle of the box 2nd serve and got passed. A very positive week, even if it ended in a very frustrating fashion. He’s pushing 35 and before this tournament he’d only played one tour match in the last month so you can’t expect much. He exceeded my expectations. He didn’t have any physical problems, he moved well, served well. No gingerly pushing the ball to protect a tweaked back, he hit his shots with full force and played stellar tennis in patches. He even played three matches in a row, when was the last time he managed that? Being 0-5 down he should never have come back in the second set, let alone held match point in the tiebreak, so it’s a very encouraging sign that he was able to fight back like that. Thiem is young and hungry and confident, he just swung for the fences and unloaded on that forehand whenever he got the chance. Got a good serve and pretty good net game, too. If he wins the title it’ll be well-earned. But back to our fave. This was just what he needed: a complicated, close match against a very tough opponent, marred by adverse weather conditions, where he was repeatedly forced to make split-second decisions on crucial points on which the entire match hinged. The only way to get match sharp again, to get to the point where he’s able to read the situation instantly and come up with the right shots at the right times, is to play such matches. This is grass so his touch and feel will come back pretty quick, he’s clearly on the upswing and I expect him to continue improving in Halle. “Stellar tennis in patches”. Yes. This. And also – “the only way to get match sharp again … Is to play such matches.” Also this. Thank you, Steve. Right on man. Well said. Thanks Steve, great positive comment. Hard not to feel gutted when he loses, especially after he fought back from 0-5 in 2nd set, but your words def helped! 🙂 And you’re definitely right on match sharpness – this will help, definitely. What I’d really like to have confirmed, is that his back is still feeling good. Yeah pretty much agreed. Wonder when first Halle match will take place? Tuesday? Positive week but annoying way to go out. Let’s hope the title drought ends in Halle yet again. 3 matches of Fed on grass was better than the entire French Open! Bit harsh, should have won but wasn’t like he easy chances. Thiem came up with some good stuff on big point. See what happens in Halle.